In the six years since I finished my studies, I travelled the world without paying for accommodation for four years, thus I know that it is very much possible to find free accommodation around the world. It was never my intention to do such a thing, it just happened with the lifestyle that I was leading and the video you see is a little breakdown of how I did it. This page offers practical advice about how you can find free accommodation when you travel, making travelling the world much more affordable, as accommodation is normally a huge expense. This page is a subpage of the travel without money advice page. Is It Really Possible To Find Free Accommodation When You Travel? Being able to save money on accommodation has enabled me to live the life of a nomad for many years. People often ask, ‘How do you afford to travel long term?’ and the answer for me is simple: I spend very little. The other option is to earn lots, but I never quite took the time to figure out how to do that! This page addresses the ultimate ways to find free accommodation, with a small resource section dedicated to sharing how I book a bed if I ever want to pay for it. As I showed in my video (above), yes it is possible to find free accommodation when you travel and I did it for over four years, but not intentionally. I have always been quite independent: When I turned eighteen, finishing school, I got into my car, drove seven hours south west across England, and found myself a caravan to live in! The four years of free accommodation was divided as shown in the pie chart, with half my nights being provided for by my job, a quarter by staying with people, a fifth from free camping, and the remaining nights were offered to me in exchange for volunteering. You can read a full breakdown of the four years here. On this page I will discuss the techniques that I have used and considered over the years. There are no sneaky vouchers or conning a system, it’s mostly just common sense, being adaptable, hanging out with some new people, and committing time in exchange for a bed. I’m going to break the advice on this page into three main sections: Free camping, staying with people (which covers family, friends, contacts, chance encounters, and CouchSurfing), and earning your accommodation (which covers volunteering, house sitting, and working). You can either read through all of the information, or skip ahead to whatever is relevant to you. Below is a little contents list of bullet points. Free Camp: Use the world as your bedroom. Stay With People: Sometimes strangers, sometimes people we know. CouchSurfing: Utilise the world’s biggest network of travellers to make new friends. Chance Meetings: Kind people you meet on the road who offer you a bed. Family, Friends, And Contacts: We have connections all over the world that can be taken advantage of. Earn Your Accommodation: Do Something That Offers You A Bed. Volunteer: Prearrange volunteer positions so that you can have a safe place to stay. House Sit: Look after someone’s home (and often their pets) while they are away. Work: Certain types of jobs offer a free place to live. Free camping is my absolute favourite way to explore the world, offering unparalleled levels of freedom, and I have free camped in tens of countries around the world. 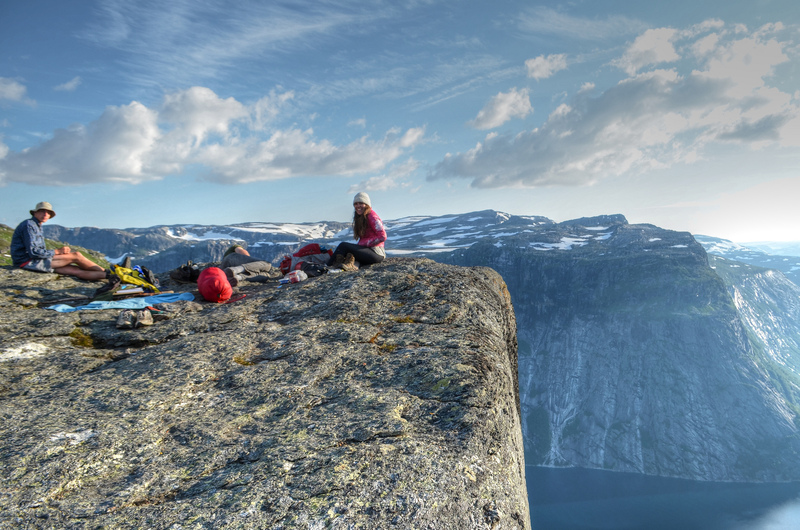 What Is Free Camping And How Do You Free Camp? On this particular night, we slept in an abandoned farm building during a storm whilst cycling across Europe. Free camping is the practice of sleeping in an undesignated sleeping place for free. This can be done in a tent, hammock, sleeping bag, or even a vehicle, but in essence follows the mantra of ‘wherever I lay my hat, that’s my home’, at least for the night. When I free camp, I normally take a multi-season sleeping bag (so it’s good for cold weather), and a hammock or a tent. When I’m in a vehicle, I take a sleeping bag or multiple duvets. The duvets are way colder, but they allow sharing of body heat… it’s way worse than a decent sleeping bag, but sometimes it’s nice, you know?! If you want to stay warm, get a decent sleeping bag. What I love about free camping is that you do it completely on your own terms and you don’t inconvenience anyone, nor do you have to answer to anyone. When free camping there are lots of issues to consider such as the legality of free camping, not leaving a trace of your existence, going to the toilet, and how best to find a safe spot. All of these issues and many more are discussed on my page, Free Camping: Where And How To Free Camp, and I suggest you read that page if you are interested in free camping. It’s exhilarating, completely free, and allows you the ultimate freedom because you can stay as long or short as you like in a place, and you can move daily if you want. Just try not to irritate people because I once got arrested for camping in a park in Amsterdam. Leah and I met all of the people in this photo through CouchSurfing. We then cycled 1,000 miles with Daniel (far left) before rafting down the Danube together. CouchSurfing is the largest network of travellers in the world and is an absolutely wonderful resource for meeting people and making friends on the road. In essence, you make a profile and contact people when you are going to a place and looking for somewhere to stay. You then stay in someone’s home with them – so it is important to remember that it isn’t a free hotel and you should give, not just take – and I have met lifelong friends in this way. After you have stayed with someone, you leave a public review, helping to build trust and safety across the site. It isn’t perfect, but it’s pretty damn awesome. Best of all, no money is exchanged (it is against the rules of the site), so you meet like minded, sociable people who are look for other fun people to hang out with. Read my full guide to CouchSurfing here for FAQs about CouchSurfing and generic CouchSurfing Advice. Firstly, be very cautious with this. For me, I have never worried much as I am not an easy physical target and it is not in my nature to think badly of people, but there are bad people in the world and some people do want to do bad things. Mostly however, people are pretty awesome and over the past few years I have ended up staying in the homes of people I have met through hitchhiking, chance encounters whilst walking, and even by asking if I can sleep on their property. Use your intuition and common sense, and let people know where you are staying to keep you safe, and have a great time meeting new friends. Six degrees of separation is the idea that all people in this world are connected by six ‘steps’ or less, where each step is a friend, meaning that anybody in the world is a friend of a friend of a… you get the point. There are interesting, albeit insufficient (due to the complexity of the issue), mathematical proofs to support this idea, but regardless of this, wherever you are going in the world, you will know someone who knows someone. Ideally this is someone you actually know in person or a family member (even if you haven’t met them), but there might also be a friend of a friend that you can stay with. This is a great way to get introduced to a place and to start meeting people, but I prefer not to take advantage of this for too long because you don’t want to be that person who turns up and way overstays their welcome. Be gracious, be friendly, and hope you get on well with your temporary hosts. When I do this, I often like to cook my hosts dinner. House sitting is a long running concept whereby you occupy someone’s house in order to look after it. Some people go away for months at a time and don’t like to leave a house unoccupied, whereas others have pets that need to be looked after. It is a great way to form a mutually beneficial relationship that offers you a place to stay for an extended period of time without having to pay any money. It used to be difficult to set up a house sitting placement as there were no centralised networks, but now there is a great selection of websites that help you arrange housesits in advance. 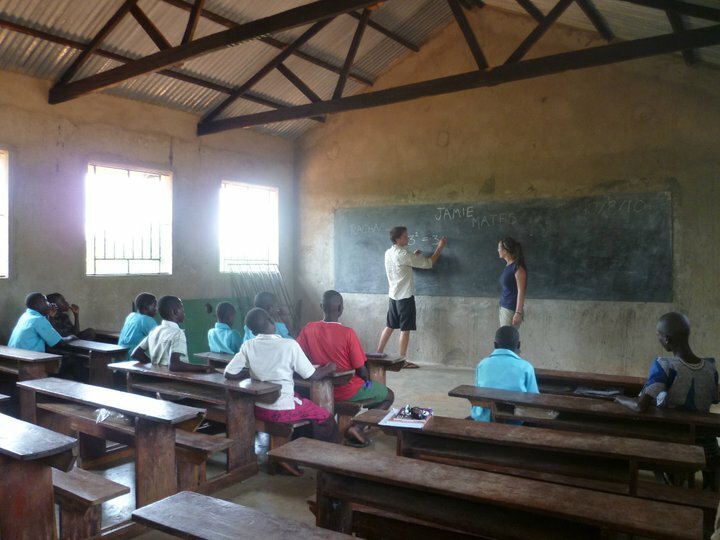 My first experience of volunteering: Teaching English and building a school in Uganda. Volunteering positions come under two main categories: Charitable volunteering and non-charitable volunteering. Charitable volunteering is where you do something for free (build a school, teach, work on a nature project, etc) that aims to make the world a better place for people, animals, or the environment. Non-charitable volunteering concerns exchanging your time for a bed (and often, food) with a business or family that needs help in some way. I have done both types of volunteering; building a school in Uganda, teaching English in Poland, building a boat in Norway, and working at hostels in Hungary and New Zealand. All of these experiences were pleasurable and gave me the opportunity to meet many people whilst having a free place to sleep at night. If you are interested in volunteering, you can read more on my Volunteer Abroad page. It also lists website where you can find volunteering positions. This isn’t quite free as money as being exchanged, so presumably your accommodation is part of your compensation package, but there are lots of jobs that will offer you a free place to live when you are working for them. Primarily I have found that I have been able to get free accommodation when working seasonal (tourism related) jobs, hospitality jobs, and when teaching English. More specifically, I found free accommodation working in a pub in Australia, working as an English teacher in South Korea, and working as a ski rep in France. If you are looking for a job as an English teacher, you can find jobs here, and some of them will provide you with a free apartment. Other than that, use your skills and be adaptable to negotiate a good deal for yourself. I always use Airbnb when I am looking for a house or apartment to stay in. It allows you to search by location, price, and property features, and is the absolute best site for looking for an actual home to stay in. You can book out a whole place with a kitchen for a reasonable price, meaning that you can find a home-from-home all around the world. If you sign up using this link, you should get some travel credit on your account (as the terms change regularly, I won’t quote numbers on this page). Hostels are a great way to meet travellers when you explore the world. 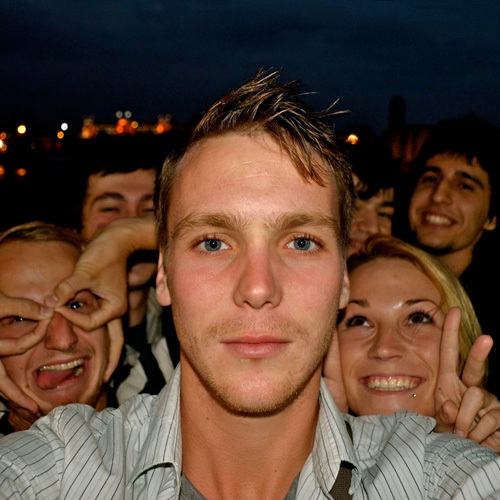 I use hostels when I want to meet other people and be involved in a lively social atmosphere. I always go to Hostel Bookers or Hostel World for this. If I want to book into a hotel, guesthouse, or bed and breakfast, I almost exclusively use booking.com. It offers cheap and varied accommodation, as well as upmarket options. I have tried loads of other booking sites, but I always come back to this one and often don’t bother checking the others anymore. You can head to booking.com to find accommodation all around the world, but if you find a website with more options at a better price, please let me know. I have been looking for years and cannot find one. Disclaimer: Some of the links on this page are affiliate links, meaning that I will get paid a commission for each sale made after clicking the link. This won’t cost you extra money, but will help to support my site and allow me to create more content.